I needed public certificate for my lab to avoid issues while testing certain libraries that did not allow untrusted connections or importing private Certificate Authority. Fortunately, there is possibility to issue free public certificates with Let’s Encrypt certificate authority. These certificates are domain validated, which means you need to own the domain for which you issue the certificate. There are three methods how the validation is done but only one can be used in fully automated mode. Why the need for automation? The issued certificates are valid only for 90 days. To validate the domain ownership you need to publish on publicly accessible web server under the certificate FQDN a specific generated verification string. You do not actually need to publish the service (and the NSX Edge load balancer) to the internet if you do not want to – I just set up a simple webserver with a sole purposed to complete the validation challenge. So what is the high level process? Own a domain for which you want to have the certificate. Set up publicly accessible web server and point to it a DNS record with the certificate FQDN. Generate challenge string and place it on the web server. Validate the domain and obtain the certificates. 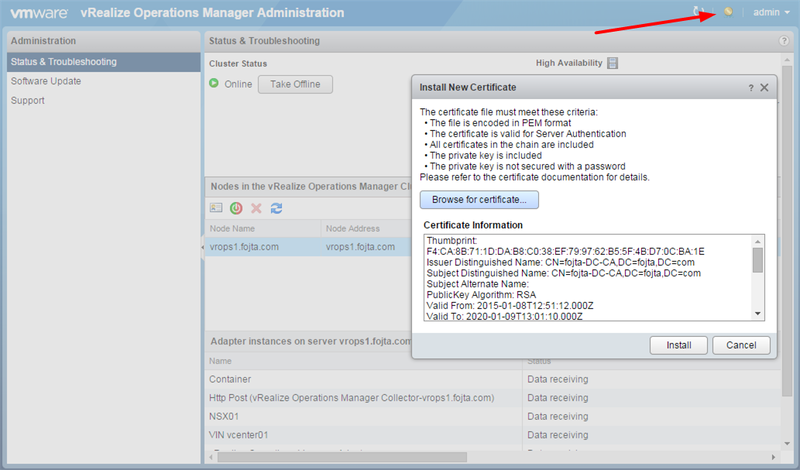 Upload the certificates to your NSX Edge Load Balancer. In 60 days repeat from #3. There are various ways how to automate steps 3-5. I have chosen to do this on Windows with PowerShell but the same could be accomplished on Linux as there are many Let’s Encrypt clients available to chose from. Then I wrote PowerShell script that first goes through the certificate generation and then using NSX API replaces certificate of a specific load balancer. Note that you need to supply NSX Manager credentials, Edge ID which is running the load balancer, application profile ID which the web server uses (can be easily looked up in NSX UI) and email and domain for the Let’s Encrypt generation process. Also be aware that Let’s Encrypt has rate limit on how many times a particular certificate can be issued within 7 day period (currently 20). Go to vRops admin portal and click the certificate icon in the top right corner (next to admin). Install the new certificate by uploading the PEM file from #4. Wait a little bit and then re-login. Reboot is not necessary. 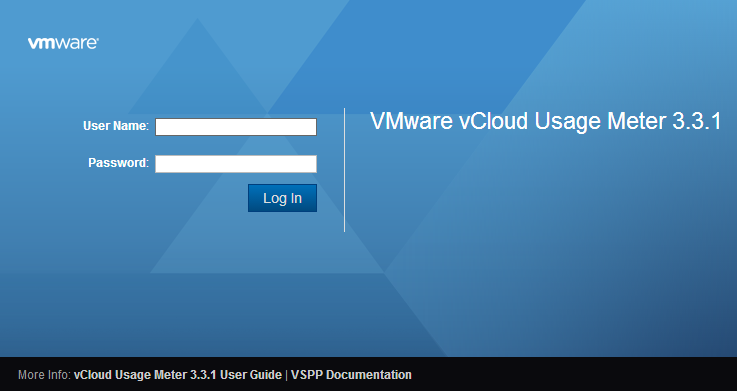 vCloud Usage Meter is a small virtual appliance used by service providers to measure their VMware product consumption for VSPP (VMware Service Provider Program) type licensing. I needed to replace the self signed certificate of the web user interface. While there is a KB article 2047572 and also a chapter in the user guide dedicated to the subject neither was correct for my version 3.3.1 installation. The keystore password is silverpen and the certificate alias is um. The location and password can be changed by editing server.xml in the same directory. Here is a quick guide how to generate and sign new certificate with java keytool. Note if you need to generate private key externally use the steps described in my older article here. This is the procedure I used to generate and import signed certificates for vCloud Automation Center 6.0. Generate private key and certificate signing request with OpenSSL. Common name is FQDN of the Identity Appliance. Sign the certificate signing request sso.csr with your CA. Download the signed certificate in Base 64 encoded format (sso.cer). In the SSO > SSL section of Identity Appliance VAMI interface (https://<Identity Appliance FQDN>:5480) choose action: Import PEM encoded Certificate. Paste the signed certificate sso.cer to the Certificate Chain section. Append CA root certificate as well. The process is identical – the only difference is the certificate Common Name and that we are using vCAC Appliance VAMI interface (http://<vCAC Appliance FQDN>:5480 for the import. In distributed architecture there can be multiple IaaS components: load balanced website components with Model Manager, Manager service with DEM Orchestrator (active/passive) and multiple Agents and DEM Workers. All those components are Windows based with identical procedure to create domain certificate. Open Microsoft Management Console (mmc.exe) and add Certificates Snap-In (manage Computer account, Local computer). Browse to the Personal Certificates folder and select action Request New Certificate. Request Active Directory Enrollment Policy > Web Server. 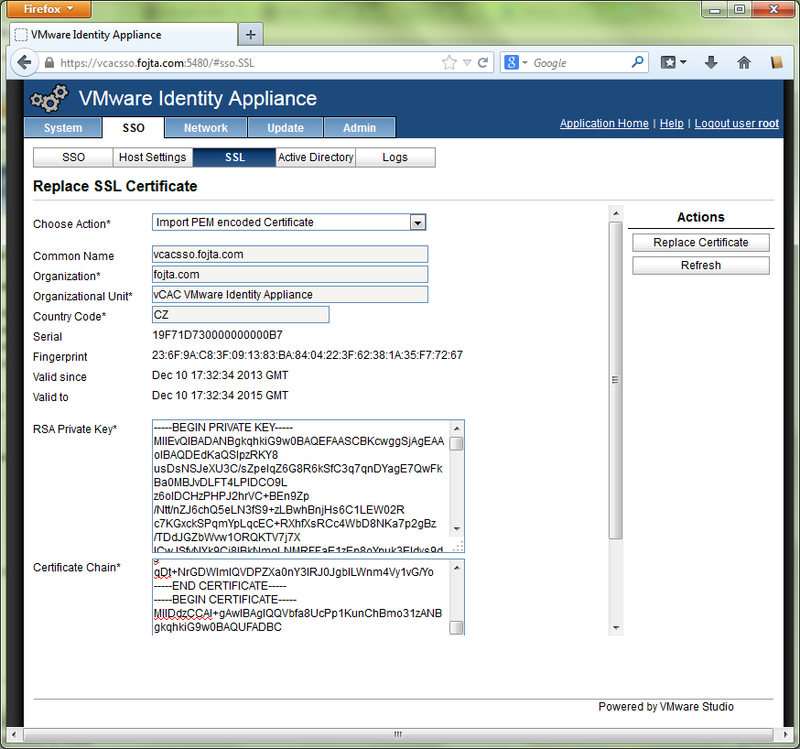 In the Subject tab configure certificate properties (FullDN, Common Name, Country, etc. ), in the General tab type friendly name and in the Private Key tab make private key exportable. Finish by clicking Enroll. Your Domain based CA should now issue the signed certificate. See my older post that describes this in more detail with screenshots. In my previous post about vCloud Connector I went through the various data flows and also explained that it is necessary to have SSL enabled both on the vCC Server and vCC nodes. It is possible to use self-signed certificates or also it is possible to upload via vCC Server/Node VAMI GUI (Virtual Appliance Management Interface) publicly trusted and signed certificates. However when you want to use certificates provided by your own Enterprise Certificate Authority the process is not so straight forward and requires using command line. The problem statement is following: I have my own Enterprise Certificate Authority which is not publicly trusted and I have issued certificates for my vCC Server and all Nodes without any intermediate certificate. How do I import them? The vCC VAMI GUI supoprts only import of certificate chain that consist of root>intermediate>certificate. As I do not have intermediate certificate I have to use JAVA keytool command. There are two keystores: cacerts for trusted root certificates and tcserver.jks for the other certificates. My Enterprise CA root certificate must be imported into the former one and the vCC Server/Node certificates to the latter. 1. Log in into the vCC Server console as root and delete the self signed hcserver certificate from tcserver.jks keystore. Note the keystore password (changeme) is hardcoded – do not try to change it. 2. Create new hcserver certificate, where CN (first and last name) is the vCC Server FQDN. Use the same password for the certificate as the keystore password (just hit RETURN when asked). Is CN=vccserver.fojta.com, OU= vCloud Connector Server, O=fojta.com, L=Prague, ST=Unknown, C=CZ correct? 4. Sign the certificate signing request (hcserver.csr) with your Enterprise CA. I have used the Subordinate Certification Authority certificate template. 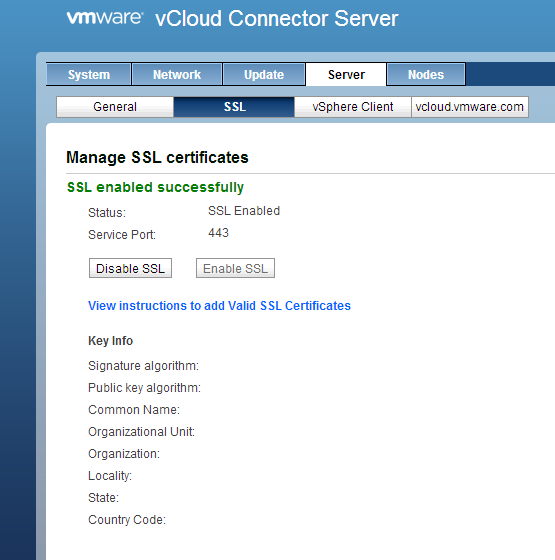 Upload the signed certificate to the vCC server as file hcserver.cer. 5. Before importing hcserver.cer certificate we need to import the CA root certificate otherwise it would not be able to build trusted chain. 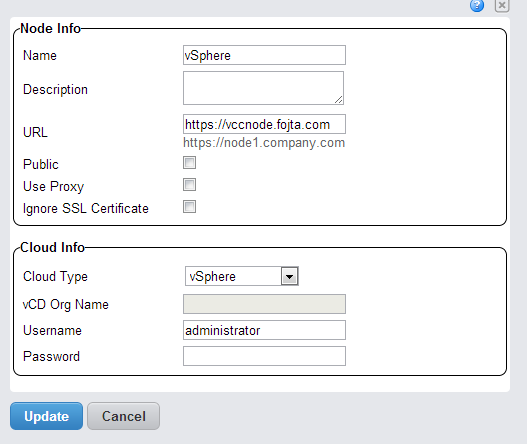 Obtain the CA root certificate (in my case named fojta-dc-CA.cer and import to cacerts keystore with following command). The alias must be unique. Note the certificate password (changeit) is hardcoded, do not try to change it (no pun intended). 7. Verify that the import was successful. Is CN=vccnode.fojta.com, OU=vCloud Connector Node, O=fojta.com, L=Prague, ST=Unknown, C=CZ correct? Now we should be able both on vCC Server and all vCC Nodes to enable SSL (in Server/Node tab, SSL subtab click Enable SSL button). When returning the the SSL tab it seems vCC is not able to get the current SSL status correctly. vCC Server displays an error and vCC Node nothing – not really sure why is this happening, just ignore it. Now we should be able in the Nodes tab on the vCC Server edit the Node configuration and uncheck Ignore SSL Certificate. If the certificate replacement was successful, the Node Status shoud be Up. For more details rather refer to the online vCloud Connector documentation as it contains more information than the PDF docs.